They were right about it being a bit of a boy’s film, however. The interplay between Kurosawa’s films and the American Western is legendary, his Seven Samurai being transformed into The Magnificent Seven. And the introduction of galloping horses into Shakespeare films is also a pivotal moment in their development from being recorded ‘theatre’ to being a ‘movie’ experience, according to Charles Ross (Purdue University, USA). He explored this in his paper ‘The uses of horses in Shakespeare on film’, which he gave at the Nottingham-Ningbo University international conference Renderings: Shakespeare Across Continents in 2008. There is more than one way in which a film can be ‘distanced’ from elements of its audience: its genre, its cultural location, its moment of production. Throne of Blood can seem distant in many of these ways. Relocated to feudal Japan, Washizu (Macbeth) and Miki (Banquo) meet a spirit in Cobweb Forest who predicts that Washizu will gain Cobweb Castle, the seat of the Lordship, but that ultimately it is Miki’s son who will inherit it. However, having minimal knowledge of Japanese culture and language, I raise more questions than I can answer. What is the significance of the fog? Is the spirit in the forest evil or neutral? 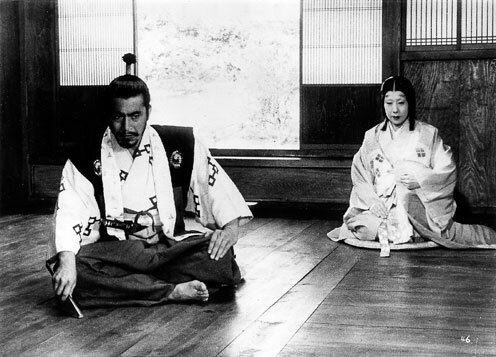 What are the bonds of brotherhood between samurai Washizu and Miki? And is there any connection between the off-screen obliteration of Cobweb Castle, leaving Miki’s son the inheritor of nothing, and Japan’s defeat at the end of World War II? Much is also lost in translation, or at least transformed. 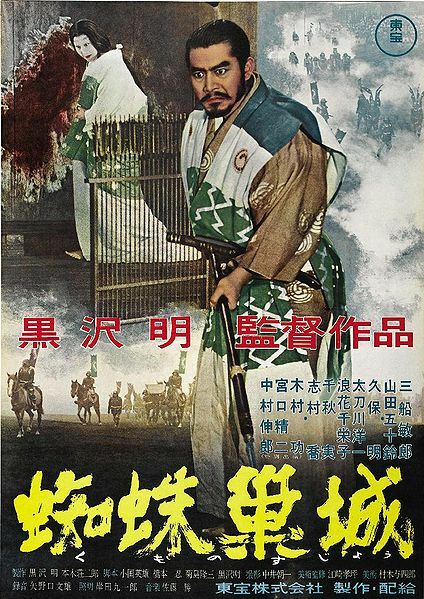 The film’s Japanese title is 蜘蛛巣城 (Kumonosu-jō) which can be translated as Cobweb Castle, a name which has connotations of children’s fairy tales in English, rather than the violent Throne of Blood. Finally, it is separated from us by time – the grainy black-and-white footage and the staginess of the acting making it seem, not so much dated as alien, a vestige of a bygone age. At the point that Asaji (the Lady Macbeth figure) appeared, however, our unappreciative little audience began to be drawn in. 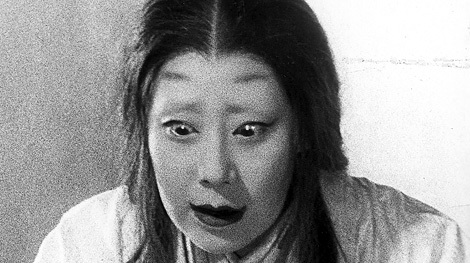 I can’t remember whether we heard her or saw her first, but it is the sense of her voice, quiet, calm, cold, cutting into the conscience of Washizu that made her so chilling and so magnificant. She knelt, robed in white, head inclined, almost motionless, and I wondered if there was any echo of this Lady Macbeth in Ryutopia Noh’s Hamlet (see post below). Likewise, to what extent is Karusawa referencing traditional Japanese theatre in this film? Asaji’s movements, costuming and make-up reminded me of pictures I’ve seen of Noh performances. 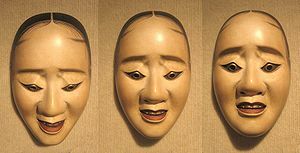 Her slow, sliding walk was possibly Noh-influenced and when she ran into the courtyard to plant the bloodied spear in the hand of a drunken guard, the covered walkway echoed the wing of the traditional Noh stage. This influence became most pronounced during her mad scene. The dominance of Asaji can perhaps have a mysoginist reading, particularly in the light of the film’s opening narrative which suggests that behind every failed, over-reaching man is an evil witch of a wife… However, she was probably the best Lady Macbeth I’ve seen. Now, I’ve spent a whole paragraph discussing Lady Macbeth’s make-up and haven’t even mentioned Washizu/Macbeth’s famous death by arrows sequence. But afterall, I am a girl.